Book People is a major independent book store in the heart of downtown Austin. As of today both Morgan’s Point and Anahuac can be found on the main floor both in the Texas Stories and Mysteries sections. I am honored to have the books of my series A Texas Story available in this prestigious Austin institution. Book People is a store that is noted for supporting local Austin writers and Texas based novels. This represents a big moment for me and it is much appreciated. Morgan’s Point and Anahuac are still available on Amazon in print and e-book. Another exciting happening is the coming availabity of Anahuac in audio book. We met with Joel Block Studios here in Austin last week to begin the process. 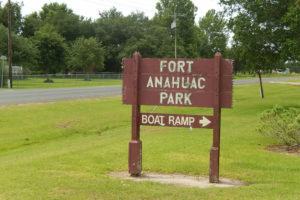 Anahuac will be recorded by a professional talent and be of the highest quality. The creation of an audio book is not as easy as it sounds. I will keep you up to date as recording progresses. If all goes as planned we should have a finished product in the spring of 2018. The holidays are fun, sometimes exhausting and upon us. When I find myself frazzled and unable to endure one more football game (never thought I’d say that) I plan to scurry into an unoccupied corner and read a book. It is almost as healthy as a mindfulness excercise. I guess the point of all this is if you find yourself getting a little holiday blues working, a book may be the answer. I am not completely caught up in technology (I say as I blog) but it is amazing how technology can unite us — we can gather based on interests as well as geography. One of the places I’ve found recently is Goodreads — it’s a community of readers (as well as writers) that does a great job of connecting people to books they might want to read. There are so many books out there, and so many good professional reviewers, but Goodreads provides a high-tech version of good, old-fashion word-of-mouth recommendations. Of course, you can now find me on Goodreads. If you’ve enjoyed what you’ve read from me — or even if you just want to announce that you WANT to read either or both of my books — Goodreads lets you do that. The page for Morgan’s Point is here, the page for Anahuac is here, and my author page (which includes my blog) is here. I am still learning how to navigate the site, but it is fun to see what your friends are reading even if they are a thousand miles away. If the holidays get overwhelming remember that a book is an excellent friend that won’t give you an ugly sweater. Happy Holidays to all. 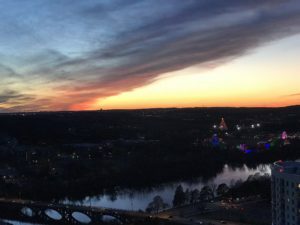 Sundown on Austin December 23, 2017. Trail of Lights on the right. Living in a high rise has proven to be interesting. For a man who was never fond of heights it has been an adjustment. I am adjusting and can venture out on the balcony with impunity. The picture is from a recent sunset out our window. It is surprising how many evenings are punctuated with beautiful sunsets. One thing that I have had to get used to is the absence of sparrows, mocking birds and the like. None of the song birds that I see at the ranch want to fly up twenty-six floors to visit. This morning there was an epic visit from a large raptor who crashed into one of our windows. After the crash I looked out and saw a raptor flying back and forth near the balcony. I was relieved because we had several owls and other large birds fly into a picture window at our former home, some with tragic results. I told Kathy the bird had flown away and all had ended well. She took a closer look out the window and reported that there was a huge bird on the balcony. To my horror I saw a giant raptor staggering around the deck looking as if he had been in a boxing match. I cautiously opened the door and it seemed to recover. It spread its wings and flew off seemingly no worse for the crash. We are doing research now to determine what it was. It was not a red tail hawk which we have seen before. It was larger than a red tail and all chocolate brown. Let us know if you have suggestions. So when you think of friends who live in the sky, don’t think that the wild kingdom can’t come visit them. I’ve had enough excitement for one day. I don’t think our friend was hurt, but doubt he will be visiting us again soon. Anahuac received a very positive review from Lone Star Literary Life that I wanted to share with you. 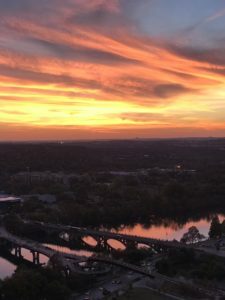 Lone Star Literary Life is an online publications that focuses entirely on books by Texas authors, often on Texas subjects. It’s an honor to be in the company of authors writing about the “miles and miles of Texas” with different approaches and perspectives. 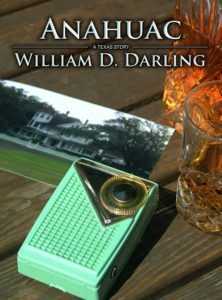 The reviewer called Anahuac “an entertaining, engrossing legal thriller that offers both darkly humorous and good-natured thrusts at life, love, and law in early 1970s Texas,” and I couldn’t ask for a better description! I encourage you to check out the site and learn more about how Texas writers like myself have been chronicling this great state. Austin writers. The local independent book store keeps your reading options open to more than just the picks that large publishers choose to print these days. 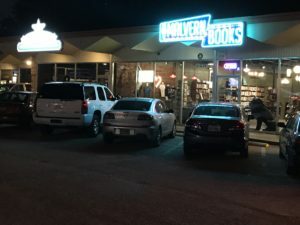 I encourage you to seek out these stores like Malvern and The Twig in San Antonio who assure that there is a wide diversity of literature available for your reading tastes. I will post a video of the Malvern event in the coming days when it becomes available. There was a positive review of Anahuac that appeared in Lone Star Literary Review this week. Writing is such solitary work that feedback is welcome even is it is unfavorable. When it is favorable, it is icing on the cake. For you who are attending tomorrow night’s book launch for Anahuac at Malvern Books, there are some things to consider. The store is in the University of Texas area just just off of Guadalupe (the Drag) on 29th Street. Those of us in Austin know that is a high traffic area and parking is at a premium. 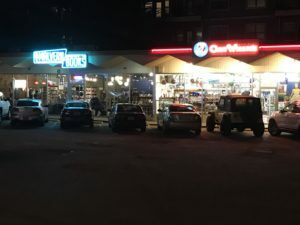 The event starts at 7, but there is a great alternative parking area that opens for the book store parking at Breed’s Hardware at 7, a half a block west of Malvern on 29th. 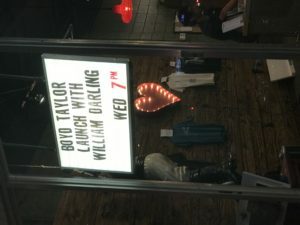 Malvern is a decent sized store, but I am sharing the stage with Boyd Taylor who goes on first. I expect between the two of us it will be crowded. There are several places for a pre-event supper close to Malvern that might ease the parking issue. The two pictures below give you an idea that Breed’s is going to be your best parking option. Malvern Books is an excellent Austin Book Store and is next to Oat Willie’s, the iconic Austin store selling all kinds of interesting things. 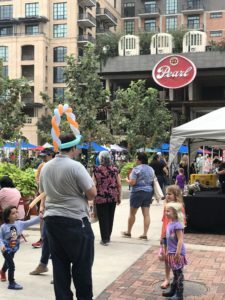 There is an Austin and UT vibe about the whole experience. Just understand they have not created any new parking in the UT area in the last two centuries. Come early, be respectful of the parking issue and have fun. I am looking forward to telling you about Sarita Jo Franklin. I think you’ll like her. 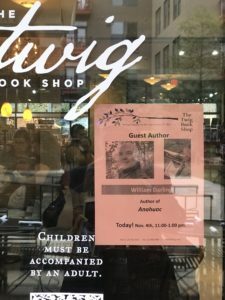 Anahuac was well received at the Twig Bookstore at the Pearl in San Antonio yesterday. 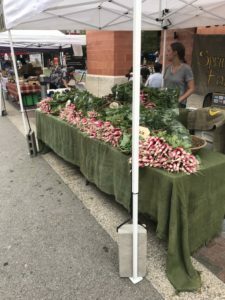 It was a beautiful day and there was a large crowd enjoying all of the excellent shops and outside vendors of fine vegetables and meats. The Twig is a wonderful bookstore and I will be returning again when I am not signing books. The staff is knowledgeable and friendly. There is a stunning array of books that will thrill the both adults and children alike. During the signing I was particularly amused by one of the children who brought two hand puppets from the Twig’s realistic animal collection over to entertain me. On the crass commercial side, I sold out of the shelf copies of my first Morgan’s Point and sold many copies of my new novel Anahuac. I am looking forward to my appearance at Malvern Books in Austin on November 8th at 7:00 pm. The day was made even more special by Dee and Gloria Keller stopping by the talk and renew old acquaintances. It turns out that Dee is a natural born salesman and had books flying off the shelves. Gloria was so kind to help spread the word that I was back in San Antonio. It’s good to have friends like these. 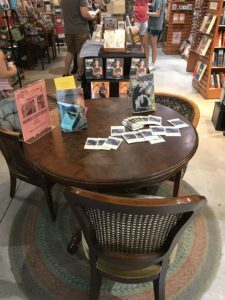 The bluebonnet seeds on the table in the picture are a give away that I bring to help direct potential readers to this web site. I loved the reactions of visitors who were either thrilled to have something to plant or not sure what they were. There are a lot of new Texans these days. There are also a lot of condo dwellers in the area and many were hesitant because they had nowhere to plant them. I told them to simply plant in nature somewhere they liked. I am the Johnny Appleseed of bluebonnets. 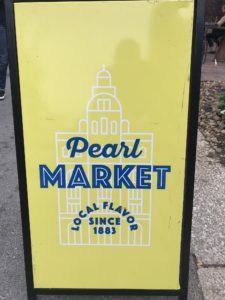 I highly recommend that you visit the Pearl on a weekend even if you don’t live in San Antonio. The sound of laughter and joy of adults and kids alike was spectacular and uplifting. The quality of the products sold in the outdoor booths was spectacular. World Class produce on sale at the Pearl in San Antonio. When I first became a trial lawyer a mentor gave me some terrific advice about connecting with a jury. He said, “tell them what you are going to tell them, tell them, and then tell them what you told them.” Tomorrow I will be signing my new book Anahuac at The Twig Book Shop at the Pearl in San Antonio between 11-1. I know I have told you this before, but just think of me as a lawyer practicing his craft. The Twig is a wonderful book store and I recommend it even if you can’t come by to see me tomorrow. That’s all I’ve got to tell you right now except for this. Hard cover, soft cover, and even electronic books can be purchased through our website which accesses a national distributor for independent bookstores. Electronic books, or e-books, can be downloaded from our website through Kobo. We welcome and appreciate your physical and/or virtual patronage. https://williamddarling.com/wp-content/uploads/2017/07/AnahuacLogo-300x75.jpg 0 0 William https://williamddarling.com/wp-content/uploads/2017/07/AnahuacLogo-300x75.jpg William2017-11-03 09:16:562019-02-25 07:12:57Tell them what you told them. I appreciate those of you have purchased my latest novel Anahuac. I have created an opportunity for you who might wonder if it is a book for you. Click here to read a portion of the book. On November 4, 2017 I will be doing a book signing event at The Twig in San Antonio for my new novel. I am looking forward to seeing old friends and new. The event is from 11 am-1 pm. I will send out a reminder the week before the event.